A bit, which is also known as a binary digit, is the smallest unit of measure for data in computers. A bit is a memory unit that has a single binary value, but can hold two possibilities: 0, 1. Computers usually provide instructions that test and manipulate bits, but they are normally designed to store data and run programs in multiple bits called bytes. All of the data in computers are represented by some pattern of bits. Small amounts of information use a small number of bits, while large amounts use a large amount of bits. Bits that are stored in RAM and hard drive can be changed by different types of software. When the Central Processing Unit (CPU) is performing instructions, it stores a bit pattern in RAM, then performs some type of manipulation and creates a new pattern of bits. When you create new patterns of bits and same them, they write over the old bits and is replaced with the new bits created. In computer systems, there are generally eight bits which create a byte. 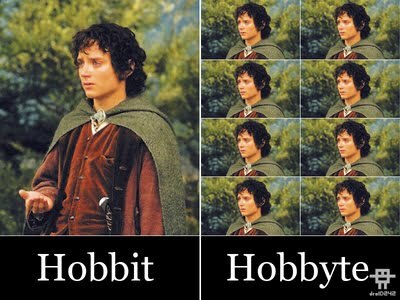 A byte is what the computer reads in order to determine what character, symbol, or picture to create on the screen. A byte is the next unit of measure for data after a bit. A byte is a pattern of 8 bits or binary digits long, which are used to represent the different letters, numbers, symbols, etc. of the English alphabet. An example of a byte is “00110111”. A byte can also hold a string of bits that need to be used in some larger unit for application purposes. 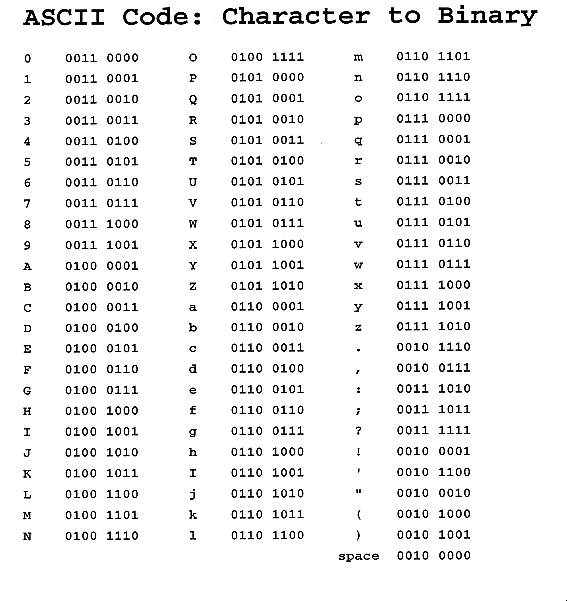 An example of this would be streaming bits that constitute a visual image for a program that displays images or the string of bits that organizes the machine code of a computer program. In computer systems, four bytes create a word, a unit that a computer processor can be designed to handle efficiently as it reads and processes each instruction. Computers use bits (0, 1)'s also known as binary digits for everything that goes on. Binary digits are the way that computers understand what is going on; it is their own special language. The term binary digit is used because the prefix "bi" means two and the computer can only understand two digits (0, 1). The (0, 1) in computers are seen as "off and on" switches. Everything a computer does is through switches which are another reason why computers only understand the two digits (0, 1). When electricity runs through the CPU the switches inside are turned on and off when they are needed and not needed. When you put together a combination of bits and for a byte(s) they create the characters that are seen on your screen. These two different types of files make it possible for the computer and person to read and present the correct document. The computer reads the binary digits and knows which file it is and what charachters are on the page and what files they are opening. When on the internet, your computer exchanges data with other computers. While on the internet you are able to download or upload files from different server domains. When you download or upload files there is a transfer of data between your computer and the other computer(s) you are downloading them from. The transfer of data is measured in bits per second (bps); bandwidth. The data transfer rate of your computer is determined by the type of connection, ie) dial-up, cable, DSL; and the traffic over the network. The bottleneck is the part of your connection that slows the data rate during transfer. There are many different files that can be downloaded but you have to be careful. The internet is a wonderful place but it can also be a terrible place. If you are not careful and downloading at will there is a chance that you might come across some malicious software/communications. This malicious software can be very harmful to your computer. To learn more about Bits and Bytes or to read news about this topic click on the links below.